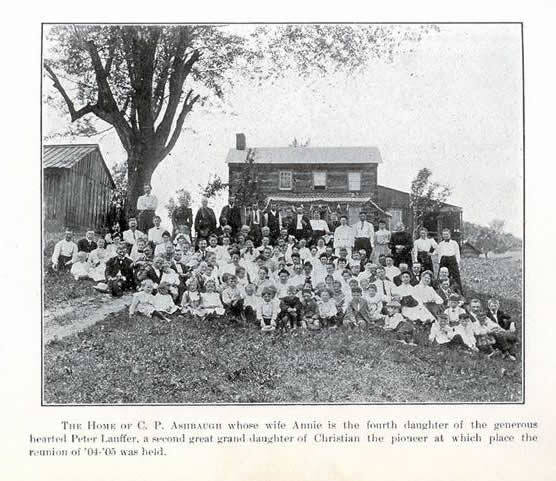 The family of Henry Lauffer, Sr., son of Christian Lauffer, the Pioneer. Henry Lauffer, Sr., was a farmer and lived all his life on the old Lauffer place, near Pleasant Unity, the farm on which Simon Trice now lives. Henry Lauffer, Sr., was laid to rest in the Old Bash Cemetery in February, 1821, aged 67 years, 5 months and 19 days. By his side rests Barbara, his wife, whose maiden name was Alliman. She died May 14, 1846, aged 75 years and 26 days. This old cemetery is on the Somer's farm of the present day, near the Thomas school house, in Unity township, Westmoreland county. It is a two acre lot, willed in perpetuity for cemetery purposes. This is the same cemetery in which his father Christian Lauffer, our common ancestor, lies buried. In Pennsylvania Archives, Volume 23, Page 226, Third Series, we find that Henry Lauffer is enrolled among "Rangers of the Frontiers 1778 to 1783" for Westmoreland county. Until the death of Henry, Sr., his son Henry lived with him on the old homestead. He kept a wayside tavern for some twenty years before his death in 1821. He was a farmer but the stage coaches passed his house, and the passengers wanted "pieces" and meals, and there were many weary travelers to be kept over night. All the grocery stores sold whiskey in those days, it was as necessary as molasses and coffee in that age, and of course, it could be found at that hospitable farmhouse. from which place Barbara was laid to rest by the side of her husband, as before stated. It was very amusing to the writer, listening to Jacob Gress and Henry Gress, of Pleasant Unity, as they related reminiscences of their grandmother. "Grandmother was real strict. She often whipped us. When mother wished us to do anything, we were in no hurry, but when grandmother asked us, we obeyed promptly. When she said anything, she meant it." 1. Henry Jr., son of Henry Sr., son of Christian, the Pioneer, was born December 27th, 1793, and his wife Anna Marie Gress was born September 3rd, 1795. They were married in September, 1814. His wife died April 24, 1870, aged 75 years, 2 months, 21 days. He died April 18, 1873, aged 79 years, 3 months, 22 days. His family bible is in the hands of his son, Isaac Lauffer, of Greensburg, and the records are in perfect form. He resided with his father, Henry Sr, on the old homestead until the death of the latter in 1821, after which he lived on a farm just west of Greensburg. He later moved into the Manor Valley. He conducted a large business and acquired considerable property. For many years he operated a Fulling Mill in the Manor Valley, on the present James McKeever farm in Penn township. Home-made cloth, flannels and blankets were brought for many miles to his mill to be fulled. Fulling shrunk the cloth and made it thicker, closer and softer. He built the first brick house in the Manor Valley. He began wagoning, driving a big conestoga wagon, with four or six horses, between Pittsburg and Baltimore, when only sixteen years old. son of Christian, the Pioneer, was born January 12, 1815, was married February 5th, 1845. Died November 5th, 1904. Interred in St. Clair Cemetery, Greensburg, Pa.
To them were born seven children: (I) Elizabeth Baer, born Dec. 9, 1838, married August 20, 1857, to Jacob Welty by Rev. W. H. Locke. To them were born eight children. (a) Emma Welty, born Aug. 3, 1858, died Sept. 3, 1904. Interred at Irwin, Pa. (b) Isaac Baer Welty, born Feb. 2, 1860, married June 28, 1893, to Olive McFarland. Resides in Irwin. (c) Franklin Lewis Welty, born July 3, 1862, died May 1, 1890. (d) Lizzie Welty, born May 3, 1864, married May I5, 1889, to James C. Overholt, of Beaver, Pa. (e) Noble Miller Welty, born Sept. 10, 1867, married June 26, 1895, to Henrietta Hoelzel. Died Feb. 6, 1900. 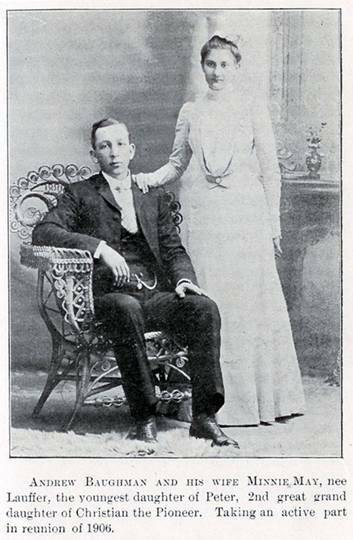 (f) Harry Thomas Welty, born Aug. 13, 1870, married June 16, 1898, to Jean Kendig. Resides at Wilmerding, Pa. (g) Ella Edna Weltv, born Oct. 20, 1873, married Apr. 24, 1900, to J. H. McKean, of Wilmerding, Pa. (h) Curtis Blaine Welty, of Irwin, Pa., born April 22, 1882. 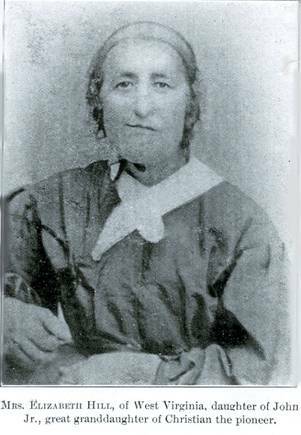 (2) Mary Baer, married to Joseph Smith, June 12, 1853. Both are dead. No data received. (3) Susanna Baer, died in childhood. 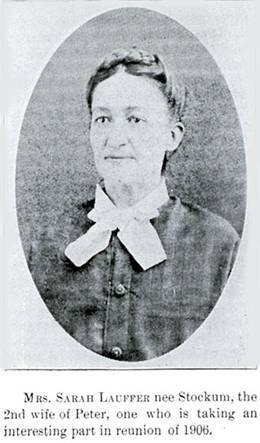 (4) Lucy Baer, born Sept. 11th , 1846, married October 23, 1854, to Amos Loughner, of Manor, by Rev. John H. Wagner. To them were born five children: (a) Logan Mayberry Loughner, of Braddock, Pa., born Nov. 9, 1865, married Sept. 8, 1887. to Katherine Mary Byers, to whom were born two children. (b) Lulu Bella Loughner ,born Oct. 8, 1867, married Nov. 27, 1884, to W. J. Beamer, of Manor, Pa., of the John Lauffer branch, to who were born two children, Lucy Margaret Beamer and Paul Beamer. (c) Frank Wilmer Loughner, born Apr. 18, 1870, died Aug. 11, 1871. (d) Charles Howard Loughner, born October 10, 1873, died Sept. 21, 1879. Both are interred in the St. Clair Cemetery, Greensburg, Pa. (e) Anna Kate Loughner, born Dec. 13, 1878, married Sept. 25, 1901, to Lawrence P. Rankin, of Braddock, Pa.
(5) William Jacob Baer, born January 7th, 1845, died in 1875. (6) Ella B. Baer, born Oct. 22, 1852, married Nov. 7, 1872, to Nelson M. Baker, of Greensburg, Pa. One child, Laura Isodore Baker, born February 18, 1873, married March 27, 1897, to Edward Mechling, of Greensburg, Pa., to whom were born Edna Isadore Mechling and Jean Mathella Mechling. (7) Anna M. Baer, born November 14, 1854, married May 13, 1875, to James L. McWilliams, of Greensburg, Pa. To them were born three daughters: (a) Edith B. McWilliams. (b) Jean L. McWilliams, married Aug. 28th, 1901, to Earl D. Fisher. (c) Efflo Proctor McWilliams. II. 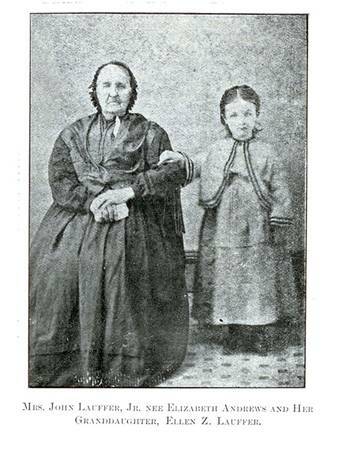 Infant daughter, lived two days, born in 1817. III. Sosanna Lauffer, born Mar. 30, 1818, died Jan. 5, 1837. IV. Maria Anna Lauffer, daughter of Henry Jr., son of Henry, Sr., son of Christian, the Pioneer, wos (sic) born Mar. 11, 1820. Married Mar. 23, 1837, to Peter Waugaman (born 1812, died 1886). She resided with her daughter at 324 South Negley ave., Pittsburg, Pa. Died Sept. 30, 1905. Eleven children. (I) Asa Waugaman, born 1840, died 1880. Married to Susanna Glunt and again to Mary Underwood. Left three children. (a) Anna Waugarnan, who married Jacob B. Petkin, and died in 1899. (b) Leonard Waugaman and (c) Marie Waugaman, both of East Liberty. Pa.
(2) Henry John Waugaman, the second in the family of Mary Ann Lauffer, died aged four years. (3) Lucy Ann Waugaman, born Sept. 17, 1843, married in 1860, to P. R. Brinker, of Manor, Pa., by Rev. N. P. Hacke. P. R. Brinker was born Feb. 18, 1841. Five children. (a) Anna Mary Brinker, born July 16, 1862. Married Feb. 18, 1885 to R. W. Evans, of Greensburg, Pa. Two children, Paul and Ruth. (b) William F. Brinker, born Mar. 16, 1865. Married Mar. 24, 1888 to Clara Pumilla Beamer. For children see Elizabeth section of John Lauffer, Sr., division. (c) Araminta D. Brinker, born Dec. 27, 1866. Married in March 1887 to W. C. Rankin, of Johnstown, Pa. Three children. Irene Rankin, born 1887, Julian Rankin, born 1889, Marguerite Rankin, born 1891. (d) Charles H. Brinker, of Manor, Pa., born July 27, 1869. Married in March; 1890, to Annie Cope. Three children. Fred. born Aug. 20, 1890. LeRoy Brinker died Apr. 3, 1893, aged two years, four months. Dorotha Brinker, born Sept. 14, 1898. (e) Roberta F. Brinker, born July 26, 1876, married Aug. 1895 to Harry O. Steiner. Two sons. Madaline Steiner, born Sept. 13, 1896, died May 16, 1902. (4) Hannah Mary Waugarnan, born 1845, died 1876, wife of Alph Brinker, Pittsburg, Pa.
(5) Zachariah Waugaman, born 1847. Dentist. Greensburg, Pa.
(6) Isaac Waugaman, born May 1849. Died Sept. 1893. Married to Agnes McClaren. Two children. Edward Waugaman, Dentist, and Maud Waugaman, both of Pittsburg, Pa.
(7) Sarah Elizabeth Waugaman, born 1851, married Dec. 1880, to Landon Warren. Died in May 1900. (8) Mariah Rachel Waugaman, born 1853. Married to Reuben Brinker, who died in 1875. Married again about 1879 to Frank Fisher, of East End, Pittsburg, Pa. One son Joseph Fisher, born in 1885. (9) Simon Peter Waugaman, born 1855, died July 1900. Married to Anna Walthour. Three children. Mabel Waugarnan, married to Charles Myers, Clarence Waugaman, also of McKeesport, Pa., and Abagail Waugaman, deceased. (10) Emma Waugaman, born Mar., 1860, married to Harry Ludwick. Two children. Hazel Ludwick and Lillian Ludwick, Pittsburg, Pa.
(11) Georgia Waugaman, born in 1864, married to Frank Rust, East Pittsburg, Pa.
June 5, 1887. William Charles Neubert, born Dec. 17, 1888. 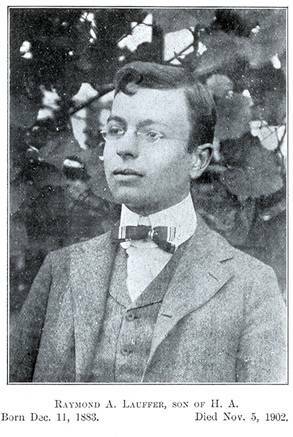 Oscar Theodore Neubert, born Feb. 5, 1890. Alice Adalie Neubert, born Dec. 7, 1892. Jacob Sylvester Neubert, born May 11, 1894, died July 20, 1894. (c) Mary Ellen Fry, born Apr. 17, 1868, married Jan. 16, 1890, to James E. Painter, by Rev. A. E. Truxal. Seven children. Bertha Bell Painter, born Sept. 13, 1890. Eva May Painter, born Sept. 21, 1891. Myrna Edith Painter, born July 11, 1893. Della Viola Painter, born Aug. 25, 1894, died Nov. 12, 1894. Interred at Denmark Manor. Frank Earl Painter, born July 19, 1896. Blanche Orpha Painter, born Mar. 17, 1898. Ada Alletha Painter, born July 18, 1902. (d) Arabella C. Fry, born Dec. 14, 1869, married Aug. 11, 1881, to James Johnston, P. 0. Humphreys, Pa. Seven children. Jennie Alverda Johnston, born Apr. 18, 1888. J. Wallace Johnston, born November 24, 1889. Maud May Johnston born June 12, 1891. Paul Clifford Johnston, born Sept. 25, 1892. Mabel Fry Johnston, born Nov. 4, 1894. Ned Ephriam Johnston, born Oct. 6, 1897. Laura Belle Johnston, born Aug. 27, 1900. (e) Simon P. Fry, born 1872, died Feb. 5, 1873. (f) Sadie Mintie Fry, born Apr. 20, 1874, married June 27, 1896, to William Reagan, P. 0. Ruffsdale, Pa. Three children. Maude G. Reagan, born Oct. 22, 1896. May D. Reagan, born July I, 1898. Harrison E. Reagan, born Nov. 6, 1900. (g) Jacob H. Fry, born Aug. 27, 1876, died Nov. 24, 1876. (h) Infant Daughter, born Sept. .3, 1878, died Sept. 7, 1878. (i) Oscar S. Fry, born Sept. 26, 1879. (j) Clifford A. Fry, born Sept. 6, 1881, died Sept. 3, 1882. (k) Eva D. Fry, born Sept. 29, 1883, died Nov. 18, 1888. (2) Mary Elizabeth Lauffer, born Mar. 2, 1848, married Oct: 10, 1867, to Zeph Brinker, of Scottdale, Pa. Five children. (a) Logan Elvie Brinker, born Aug. 25, 1868, died Oct. 7, 1880. (b) Wilson Melvill Brinker, born Feb. 26, 1873, married Dec. 20, 1899, to Mary Ellen Smith. Johnstown, Pa. Two children. Maybelle Fern Brinker, born Oct. 22, 1890. Jackson Brinker, born July 15, 1903. He was Bugler in Co. K, 10th Pa. Vol., and saw service in P. I. (c) Carlton Sherwood Brinker, born Aug. 13, 1878, died Oct. 12, 1880. (d) Myrna Mae Brinker, born Apr. 8, 1883. ( e ) Susa Fern Brinker, born July 12, 1887, died Apr. 21, 1892. (3) Henry A. Lauffer, the Manor merchant, was born Mar. 10. 1850: married June 27, 1872, to Josephine L. Beamer (born June 2, 1855) by Rev. N. P. Hacke. H. A. Lauffer is president of the Manor National Bank, and has been a director in the Irwin National Bank ever since its organization. He is a member of councils. Four children. (a) Infant Son died Sept. 4, 1873. Interred at Denmark Manor. (b) Charles Alpheus Lauffer, born July 27, 1875. As secretary of the publication committee, he has compiled for the printers most of the data presented in this book. He received his A.B. degree from Franklin and Marshall College in 1900 and his M.D. degree from the University of Pennsylvania, in 1905. He is now resident physician at the Chester Hospital, Chester, Pa., (c) Maude J. S. Lauffer, born Dec. I. 1880, a graduate of Woman's College, Frederick, Md., and teacher in the Third Ward schools, in Allegheny, Pa. (d) Raymond Abner Lauffer, born Dec. 11, 1883. He graduated from the Academic department of the Greensburg Seminary in June, 1899. For two years attended the Western University of Pennsylvania, where he took first prize in mechanical drawing. Employed by the Westinghouse Electrical Co., at draughting. Died Nov. 5, 1902, in his Junior Year, while a student at Massachusetts Institute of Technology, Boston, Mass. Interred at Brush Creek Cemetery. (4) Hannah C. Lauffer, fourth in the family of Jacob F., was married in the spring of 1873 to James Steel, of near Hannastown, Pa. She had one son, Elmer Steel, married. Three children. No response. (5) Edward C. Lauffer, born Oct. 10, 1854. Married June 24, 1880 to Salome Waugaman. Irwin Pa., R. F. D. Ten children. Harry Lauffer, born Dec. 2, 1881, died Aug. 23, 1901. Hiram Josiah Lauffer, born June 27, 1883. Lloyd Jacob Lauffer, born June 13, 1885. Joseph Iddings Lauffer, born Apr. 2, 1887. Clarence George Lauffer, born Apr. 29, 1889. Mase Coyl Lauffer, born Jan. 15, 1891. Paul Price Lauffer, born Aug. 19, 1892, died Sept. 4, 1894. Loula Frances Lauffer, born Nov. I, 1894. Edith Irene Lauffer, born Sept. 2, 1896, died Dec. 23, 1896. Adella Elizabeth Lauffer, born Mar. 27, 1901. (6) Maranetta Arabel Lauffer, born Oct. 6, 1856. Married Nov. 11. 1875, to Aaron Bushyager. Harrison City, Pa. Five children. (a) Gertrude Evelin Bushyager, born Sept. 28, 1876, married Nov. 23, 1898, to William Howard Newcomer. One daughter. (b) Charles Edward Bushyager, of Youngwood, Pa., born July 15, 1878. Married. (c) Howard Osmond Bushyager, born Jan. 23, 1880. (d) Milton Clifford Bushyager, born July 8, 1881. (e) Homer Jacob Bushyager, born May 2, 1883, died Aug. 9, 1883. (7) Gilbert William Lauffer, born Mar. 22, 1859. (8) Sarah Ellen Lauffer, married to Jas. A. Beamer. Two daughters, Blanche and Margaret. 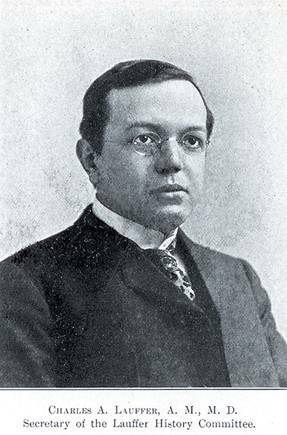 (9) Oliver A. Lauffer, born Sept. 17, 1863. Accidentally shot while rabbit hunting, Dec. 23, 1878. (10) Annetta R. Lauffer, born Mar. 10, 1866, married Dec. 17, 1885, to Elijah Bushyager. Harrison City, Pa. Eight children. John Wallace Bushyager, born Oct. I, 1886, died Dec. 18, 1837. Curtis Elton Rushyager, born Dec. 9, 1887. Roy Orton Bushyager, born Apr. 15, 1890. Lee Ross Bushyager, born Jan. 20, 1894. Merle Jay Bushyager, born Feb. 5, 1895. Hazel Fern Bushyager, born Mar. 5, 1896. Glen Ray Bushyager, born Nov. 19, I897. Annetta Margaret Bushyager, born May 12, 1901. V. Henry Lauffer, born Mar. 25, 1824, died Nov. 15, 1833. VII. 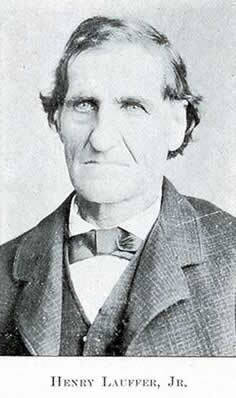 Samuel Lauffer, son of Henry Jr., son of Henry Sr., son of Christian, the Pioneer, was born Sept. 28, 1826, died in 1890. "At Cumberland, Md., in her early home, among her dearest friends, Mrs. Eliza Ellen, wife of Samuel B. Lauffer, of Pittsburg, Pa., and eldest daughter of Hon. L. N. Buchanan, of Allegheny Co., Md., aged twenty-seven years, eight months. twenty-two days." He was for many years postmaster at Greensburg, Pa. He later conducted a book store on Wood street, Pittsburg, and at the beginning of the Civil war, entered the service. He was in the Federal service the rest of his life. He left one son, John Lauffer, of Washington, D. C., lately deceased. VIII. William Paul Lauffer, born Apr. 22, 1828, died Sept. 13, 1839. IX. Isaac Lauffer, son of Henry Jr., son of Henry Sr., son of Christian, the Pioneer, of Greensburg, Pa., born May 12, 1830, married Mar. 10. 1853, to Lydia Fox. Eight children. (I) Cyrus Markle Lauffer, born Jan. 25, 1854, died Apr: 10, 1855. (2) Anna Mary Ellen Lauffer, born July 12, 1855. Married to James S. McKeever, June 1, 1876, by Rev. N. P. Hacke. Harrison City, Pa. Ten children. (a) Harry C. McKeever, born May 14, 1877, married June 25, 1902, to Jean Elizabeth Wilson. To them was born Helen Wilson McKeever July 8, 1903. Died Sept. 8, 1905. (b) Frank E. McKeever, born May 14, 1877. (c) Twins Mattie E. and Lydia F. McKeever, born Jan. 14, 1881 ; died Aug. 2, 1834 and Feb. I7, 1886. (d) I. Ross McKeever, born Sept. 18, 1882, married in May, 1905, to Jessie GREENAWALT, Wilkinsburg, Pa. (e) John Paul McKeever, born Sept. 21, 1885. (f) Alice May McKeever, born Aug. 31, 1887, died Aug. 30, 1893. (4) Edith Grace McKeever, born Oct. 13, 1889, died Sept. 4, 1893. (h) Agnes L. McKeever, born June 27: 1892, died Sept. 14, 1893. (i) Infant born Oct. 25, 1898, died same day. Interred at Union Cemetery, Irwin, Pa.
(3) William D. Lauffer, of Penn Twp., Westmoreland Co., Pa., born Aug. 30, 1856, married, Feb. 2, 1882, to Annie E. Klingensmith, by Rev. J. F. Snyder. Six children. Pearl Lydia Lauffer born Dec. 31, 1882. Frank Foil Lauffer, born Aug. 25, 1884. Mazie Elizabeth Lauffer, born June, 8, 1886. Elsie Florence Lauffer, born Nov. 21, 1887. Coyt Brooks Lauffer, born Aug. 22, 1889, died .July 16, 1894. Rosco Love Lauffer, born Oct. 7, 1891. (4) Alice Rebecca Lauffer, born Jan. I5, 1858, married Jan. 13, 1881, to Mose McIlvain, of Boquet, Pa. Six children. O. Taylor McIlvain, born Feb. 4, 1882. Nina F. McIlvain, born Apr. 1, 1883. L. Mabel Mcllvain, born Sept. 23,1886. Edna F. McIlvain, born Mar. 8, 1889. Mary E. McIlvain, born Oct. 29, 1892. A. Ellen McIlvain, born July 19, 1898. Reformed church at Aaronsburg, Centre Co., Pa. Two children. Ruth Edna Lauffer, born Dec. 22, 1897. Paul Gideon Lauffer, born Oct. 9, 1900. (6) Henry John Lauffer, born Dec. 31, 1860, married Feb. 22, 1882, to Nannie J. Russell. Irwin, Pa. Six children. Perry I. Lauffer, born Apr. 7, 1883. Mattie L. Lauffer, born Sept. 20, 1885. 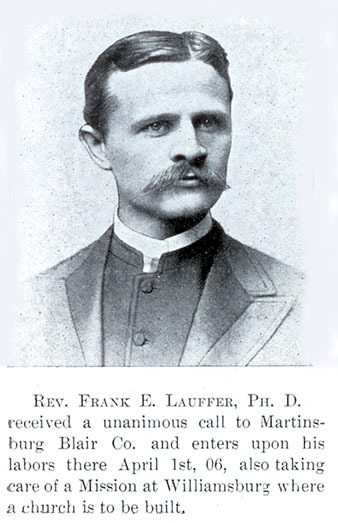 Frank H. Lauffer, born Jan. 11, 1888, died Oct. 3, 1898. 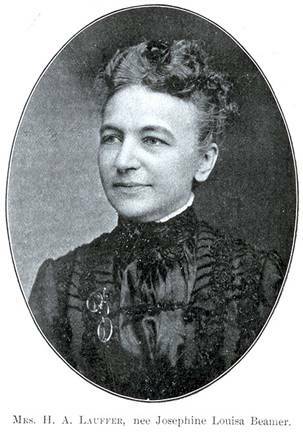 Bertha C. Lauffer. born Apr. 30, 1890. John F. Lauffer, born Aug. 20, 1893. Margaret G. Lauffer, born Feb. I, 1898. (7) Infant child born Sept. 16, 1862, died Nov. 12, 1862. (8) Elmer E. Lauffer, born Nov. 10, 1863, married May 29, 1890, to Anna Elizabeth Fink. P. O. Trauger, Pa. Seven children. Olive D. Lauffer, born Mar. 29, 1890. Fink E. Lauffer, born Nov. 14, 1891. Lydia E. Lauffer, born Oct. 16, 1893. Edgar I. Lauffer, born Sept. 9, 1895. Clarence J. Lauffer, born Mar. 17, 1898. Elton H. Lauffer, born July 20. 1900. Mabel I. Lauffer, born Feb. 13, 1902. (9) Elizabeth Florence Lauffer, born Feb. 26, 1867. Died Apr. 7, 1877. X. Paul Lauffer, born Oct. 23, 1832, died Sept. 21, 1840. XI. Simon Peter Lauffer, son of Henry Jr., son of Henry, Sr., son of Christian, the Pioneer, was born Aug. 4, 1837, died 1902. He spent his last years in the Soldiers' Home at Washington, D. C. From his being so long in the military service in Utah, he was familiarly known as "Utah Simon." XII. 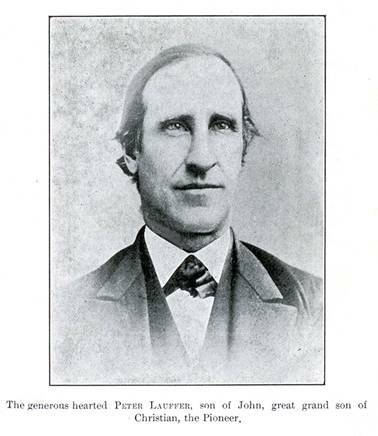 John Lauffer, youngest in the family of Henry Jr., son of Henry Sr., son of Christian, the Pioneer, was born in 1839, died of a fever in 1857. Interred at Denmark Manor. Elizabeth Lauffer, daughter of Henry Sr., the son of Christian, tile Pioneer, was born in 1795 and died in 1869. She was married in 1814 to Adam Rumbaugh. Her grandson says: "My mother died in 1869 and my father died in 1870, six months after mother's death. They are interred in the Cemetery on the Rumbaugh farm." When they moved to Ohio, in March, 1817, to their farm, in Wayne Co., ten miles north-west of Wooster, the county seat, they took with them one son, Issac Rumbaugh. We consider the letter of Jacob Rumbaugh of sufficient interest to reproduce it. 14 Cottage St., Ashland, O. In 1816 my grandfather Lauffer entered five quarter sections of land in Wayne Co., O. One section for each of his children, two boys, Henry and John Lauffer, three girls, Mrs. Susan Hartzell, Mrs. Polly Gress and my mother, Elizabeth. My parents the following March, 1817, moved from Westmoreland Co., Pa., to Ohio, then called the Far West, to the quarter section of land my mother received of my grand father, Henry Lauffer. I have three deeds to this quarter section of land. The first is printed on buck skin, conveying the land from Jas. Madison, President of the United States, to Henry Lauffer, of Westmoreland Co., the twentieth day of December 1816. The second deed was written on buck skin by John Wells, Notary Public, of Greensburg, Pa., in 1817, conveying the quarter section of land from my grandfather Henry Lauffer, to my father Adam Rumbaugh. The third and last deed conveyed the land in 1864 from my parents to myself. I was born and raised on the farm, lived forty-two years on the farm. When my parents settled on this farm, Wayne county was perfect wilderness. I many times heard my mother relate that they cut part of the way from Wooster to ten miles northwest of Wooster to the farm. In the ten miles there were but two families living on the road between them and Wooster. They did not know of any white settlers to the north-west of them. This is a beautiful farm of 172 acres. We will keep it in our family as long as it is in our power to do so. Elizabeth Lauffer had eleven children. Pa., married in 1836 to Mary Rumbaugh. Married again in 1855 to Catharine Piffer. Died in 1888, interred in the cemetery in the corner of the Rumbaugh farm. We have no data of descendants further than that Dr. Rumbaugh, Chicago Junction, Huron Co., Ohio, is a descendant. There were eight children. (4) Henry Rumbaugh, born 1821, married 1843, to Mary Rice. 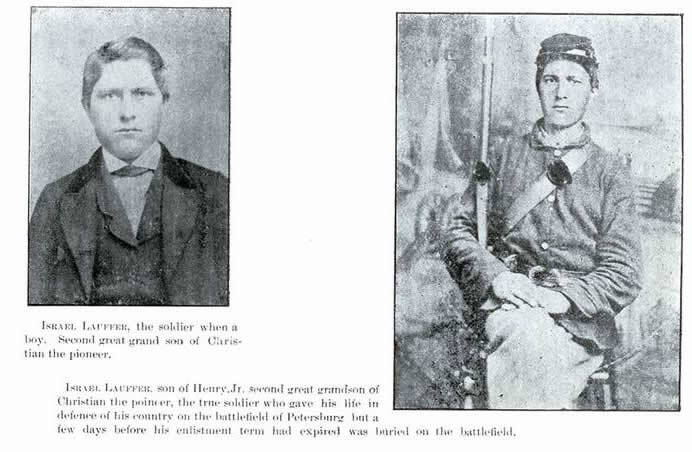 He was a soldier and died in Camp Chase, Columbus, O., 1865. He and his wife are interred at Bucyrus, 0. He had four children. 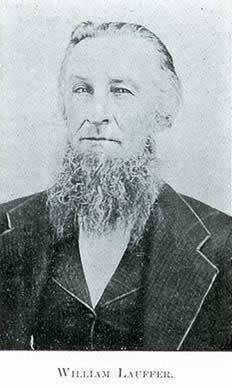 (5) David Rumbaugh, born 1823. Married in 1844, to Susannah Ickes. Died 1894. Interred in Medina Co., O. Seven children. 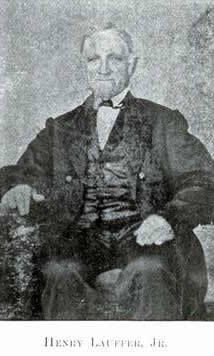 (6) Solomon Rumbaugh, born 1826. Married 1854, to Mary Miller . Died 1893, interred in Wayne Co., Ohio. Five children. 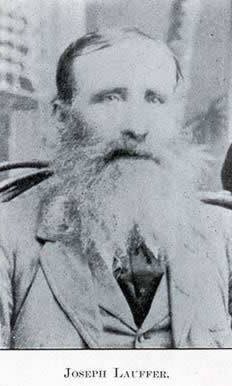 (7) William Rumbaugh born in 1828. Married in 1553 to Elizabeth Stratton. Died in 1895, interred in Albany, Oregon. Five children. 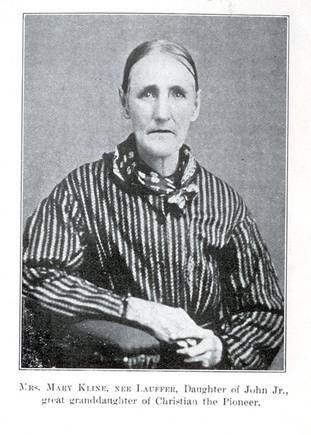 ( 8 ) Sarah Rumbaugh, born in 1830. Married in 1854 to John Feters. Died in 1898, interred in Wayne Co., Ohio. Five children. (9) Hannah Rumbaugh, born in 1333. Married in 1853 to Isaac Ickes. Died in 1896, interred at Ft. Recovery, O. (10) Jacob Rumbaugh, the only one now living in the family of Eliz. 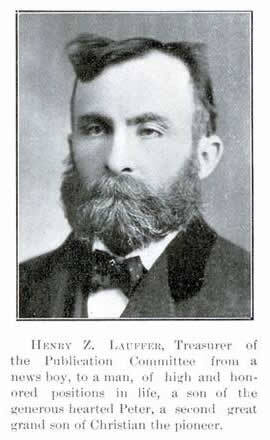 Lauffer, daughter of Henry, Sr., son of Christian, the Pioneer, was born in 1835. Married in 1859 to Mary Mowrey by J. J. Excell. She died in 1875 and is interred in Wayne Co., Ohio. Married again in 1878 to Agusta Latta. She died in 1900. interred at Ashland, O. Married a third time to Mary Weimer, in 1903. It is by courtesy of Jacob Rumbaugh , that we have the data presented in this section; not having heard from his brothers and sisters, or their descendants, directly, the data for them is necessarily incomplete. Jacob Rumbaugh has three children. 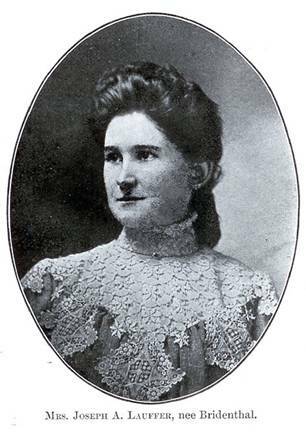 (a) Sarah A. Rumbaugh, born 1856. Married in 1877 to Dr. L. B. Ash, of Ashland, Ohio, One son, Dr. R. C. Ash, born May 10, 1880. Graduate of the College of Physicians and Surgeons of the University of Chicago. Address Ashland, O. (b) Ella Rumbaugh, born in 1864, married in 1889 to G. W. Schmidt, of Mansfield, O. One daughter, Olga Orrelia Schmidt, born Feb. 29, 1892. (c) Ira G. Rumbaugh, born in 1871, married in 1892 to Cora Reed, Greenwich, Ohio. (11) Elizabeth Rumbaugh, born in 1838. Married in 1858 to David Mowrey, of Wooster, Ohio. She died in 1896, and was interred in Wooster, O.
Mary Lauffer, daughter of Henry Sr., the son of Christian, the Pioneer, was born July 16, 1799. She was married Mar. 12, 1818, to Jacob Gress by Rev. Henry Hobblestone. She died Sept. 2, 1880, aged 81 years, I month, 16 days. Jacob Gress was born Mar. 11, 1793, died Feb. 13, 1883, aged 89 years, 11 months, two days. We copied the family record from the old Family Bible, now in the hands of her son, Jacob Gress, of Pleasant Unity, Pa. Eight children. Cease, by Rev. Cummings. Four children. Address 2620 Carey Alley, S. S., Pittsburg, Pa. Carrie Alverda Gress born Aug. 2, 1892. William Edward Harvey Gress, born Nov. 9, 1894. Nellie Elizabeth Gress, born Jan. 6, 1897. Daniel Nevin Gress, born Aug. 24, 1901. (m) Rev. Daniel Gress, born Aug. 25, 1872, Pastor of the Reformed church at Centre Hall, Centre Co., Pa. Married Sept. 2, 1903 to Emma J. Black. One daughter. (n) Sarah J. Gress, of Pleasant Unity, Pa., born June 2, 1875. 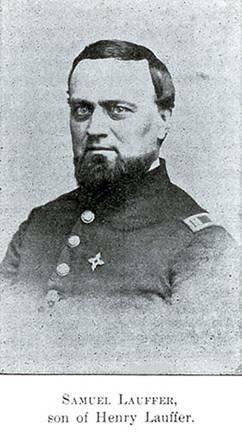 (2) Isaac Gress, son of Mary Lauffer, daughter of Henry Sr., son of Christian, the Pioneer, was born Sept. 14, 1820. Died Jan. 2, 1873. Married Apt. 22, 1858, to Lucinda Trauger, who was born Sept. 16, 1834, died May 4, 1878. Four children. (a) Anna M. Gress, horn May 16, 1859, married Aug. 28, 1877, to Edgar G. Walter, of Pleasant Unity, Pa., by Rev. W. L. McGrew. Five children. Infant daughter born April 28, 1878, died April 28, 1878. Second twin died May 9, 1873. Both interred at Pleasant Unity, Pa. Homer Trauger Walter, born Nov. 23, 1879, married Oct. 10, 1901 to Emma G. Ulam. Latrobe, Pa. Clara Walter, born Jan. 15, 1883. Frank Wakefield Walter, born Mar. 27, 1887. (b) Infant daughter born Feb. 27, 1863, died Feb. 27, 1863. Interred at Ridge church. (c) Sarah Melinda Gress, the other twin, born Feb. 27, 1863. Married Oct. 13, 1880, to Frank D. Trauger by Rev. B. B. Ferer. Frank D. Trauger was born Nov. 2, 1856, died Feb. 11, 1888. Interred at Ridge church. One child. Lucinda Elizabeth Trauger, born April 11, 1885. Sarah M. Gress married again Dec. 22, 1892 to George B. Immel, of Lycippus, Pa., by Rev. C. R. Diffenbacher. He was born May 9, 1864. (D) Ira Harvey Gress, born Mar. 6, 1871, married Sept. 26, 1895 to Ina M. Brinker (born Dec. 31, 1873), by Rev. C. R. Diffenbacher. Four children. P. 0. Pleasant Unity, Pa. Mary Cari Gress, born June 30, 1896. Sarah Melinda Gress, born Dec. 25 1897. William Brinker Gress, born Dec. 5, 1899, died Dec. 3, 1900, interred at Union Cemetery, Greensburg, Pa. Harry Trauger Gress, born Aug. 2, 1904. Hacke. He was born April 3, 1819, died May 29, 1897. Sarah Gress died Jan. 9, 1900. They and seven of their children are interred in Fisher’s Graveyard at the old homestead. Nine children. (a) Jacob Gress Fisher, born Oct. 14, 1843, died Sept. 30, 1861. (b) Malinda Fisher, born Dec. 14, 1844. died Dec. 25, 1854. (c) Franklin Fisher, Homestead, Pa., born Oct. 20, 1847. (d) David Fisher, born July 21. 1949, married Oct. 19, 1869, to Mary C. Byers (born June 14, 1849, by Rev. Henry Cooper, 521 Ammon st., Homestead, Pa. Four children. John Franklin Fisher, born, July 23, 1870, married June 22, 1898, to Clara Paden, by Rev. J. M. Carter; to them was born Marian Leanoir Fisher, Nov. 28, 1899. 525 Ammon St., Homestead, Pa. Sarah Gress Fisher, born Oct. 28, 1872. Homer Byers Fisher, born Dec. 11, 1877, died May 25, 1881. Howard Albanus Fisher, born Mar. 1, 1883, died July 13, 1883. Both are interred in the Homestead Cemetery. 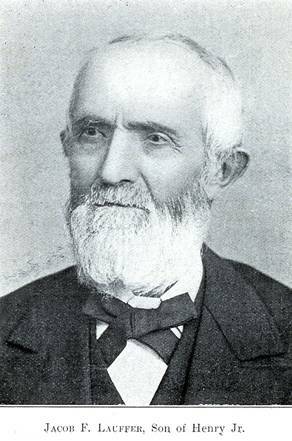 (4) Jacob Gress, son of Mary Lauffer, daughter of Henry Sr., son of Christian, the Pioneer, was born Sept. 27, 1825. He was married Mar. 20, 1856, to Mary C. Rumbaugh, (born June 1, 1836, died April 6, 1853) by Rev. Nicholas P. Hacke. Married again June 9, 1870 to Maria Zimmerman (born Dec. 8, 1835, died May 8, 1879) by Rev. A. J. Heller. Married the third time Mar. 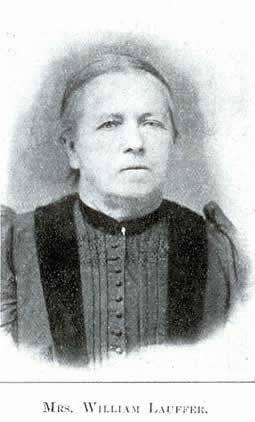 15, 1881 to Julia Ann Hess (born July 18, 1840) by Rev. B. B. Forer(sic). P.O. Pleasant Unity, Pa. Six children. 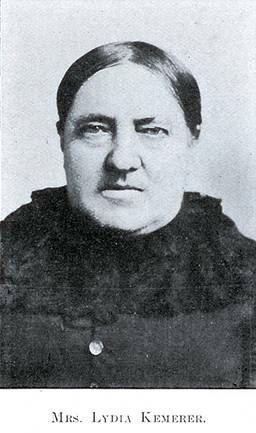 (a) Mary Calvena Gress, born Jan. 6, 1857. Married Nov. 4, 1875 to Jesse K. Poorman, by Rev. David B. Lady. Seven children. Clark L. Poorman, of Trauger, Pa., born Jan. 18, 1876. Della A. Poorman, born Sept. 27, 1877, married Mar. 17, 1894, to Charles Myers, of Greensburg, Pa. Laura F. Poorman, born Nov. 13, 1880, married June 25, 1896, to Robert Currie, of Moundsville, W. Va.; died Nov. 7, 1886, interred at St. Paul Cemetery. Franklin L.
Poorman, born June 8, 1884. Nellie C. Poorman, born Nov. 16, 1886, married Dec. 19, 1902, to Charles Bliss, of Greensburg, Pa. Jennie C. Poorrnan, born Sept. 14, 1888, Greensburg, Pa. William N. Poorman, born Sept. 9, 1890. April 30, 1873. Aged two days. (e) John R. E. Gress, of Pleasant Unity, Pa., born Oct. I, 1875. Married to Estella Snednan. (f) Infant son died May 2, 1879. 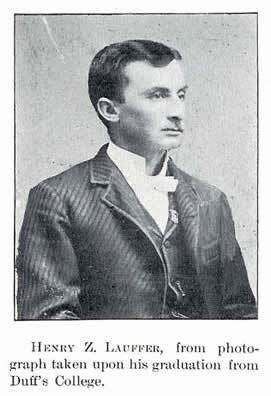 ( 5 ) Simon Gress, son of Mary Lauffer, daughter of Henry Sr., son of Christian, the Pioneer, was born Mar. 1, 1828. Married to Lavina Blithe. He died in Mar. 1900. Four children are interred at Ridge Cemetery. Ida Amelia Gress, died Feb. 22, 1862, aged 4 years, l0 months. Samuel A. Gress, died Jan. 19, 1863, aged 3 years, 6 months, 23 days. Also an infant son and infant daughter. Other children are: Clark, Carry, John, Rosy, and Olive Gress. No report. 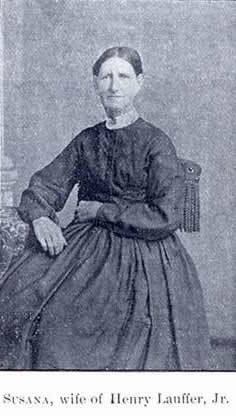 (6) Mary Ann Gress, born Sept. 25, 1832. Died May 23, 1836. Interred in North Washington Township, Westmoreland Co., Pa.
(7) Elizabeth Gress, born Aug. 22, 1835, died May 2, 1843. Interred in Unity Tp., Westmoreland Co., Pa.
(8) Lucinda Sophia Gress, of Greensburg, Pa., born July 9, 1838. Married to Isaac Smail, One daughter, married to Charles Brown, of Greensburg, Pa.
Susanna Lauffer, daughter of Henry Lauffer, Sr., son of Christian Lauffer, the Pioneer, was married to George Hartzell. Their family consisted of four boys and six girls. Their old Family Bible is still in existence, but the records have not been sent to us. We are indebted to Rev. C. M. Hartzell for a list of names, and to John F. Harshey for records of the Leah Hartzell branch. The children were Maria, Elizabeth, Hannah, Jacob, John, Sarah, George, Susanna, Henry and Leah. ( 1 ) Maria Hartzell and John Chambers: six children. Latta, Matilda, Preston, Cyrus, Daniel and Porter. (2) Elizabeth Hartzell and Henry Cease; Three children: Martin George and Henry. (3) Hannah Hartzell and John Rumbaugh : Seven children. George, Susannah. Mary, William, John Isaac and Daniel. (4) John Hartzell and Anna Maria Errett: Seven children. William H., George W., John M., Cyrus M., Samuel, Frank A. and Lizzie. ( 5 ) Sarah Hartzell and Jacob Hairr: Two children. Mary and Susannah. (6) George Hartzell and Hannah Barnhart: Nine children. Mary, Abraham, Hannah, George, Amanda, Emma, Cyrus. Lewis and Lydia. (7) Susannah Hartzell and James Rumbaugh: Seven children. Mary, Sarah, Emma, Marian, George, Harry and Cora. (8) Leah Hartzell and Henry Hershey: Four children. Sarah, Amanda, John and George. Under Section 4, we can add: Cyrus Markle Hartzell, born July 7, 1856, son of John Hartzell, the son of Susanna Lauffer, daughter of Henry Sr., son of Christian the Pioneer. He was married Oct. 30, 1879, to Elizabeth Mitchell, by Rev. C. R. Dieffenbacher and Rev. Stevenson. Four children. Grace Emma Hartzell, born Dec. 19, 1180. Greensburg, Pa. Mary Jane Hartzell, born March 1, 1882, died Jan. 23, 1892, interred at Seanors. Anna Elizabeth Hartzell, born Sept. 22, 1887. Ruth Hartzell, born Nov. 29, 1892. He was again married to Alice Carey Brindle by Rev. C. R. Dieffenbacher Sept. 15, 1896. Two children. Lewis Howard Hartzell, born April 13, 1899. Helen Hartzell, born May 21, 1905. Under Section (I) we can add: Daniel Chambers, of Pleasant Unity, Pa., son of John Chambers and Mariah Hartzell, daughter of Susanna Lauffer, daughter of Henry Sr., son of Christian, the Pioneer. Daniel Chambers was born Aug. 13, 1844. Married Apr. 17, 1877, to Matilda J. Steele by Rev. A. Fulton Boyd. Six children. James Steele Chambers, born Apr. 7, 1877. 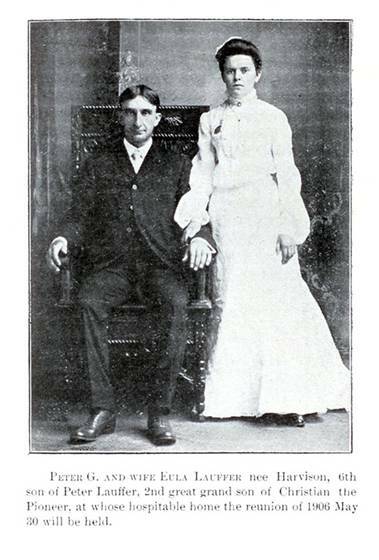 Married June 10, 1902, to Jessie Truxal by Rev. Stanley Krebs. John Porter Chambers, born Aug. 4, 1881. Mary Eva Chambers, born Apr. 5, 1882. 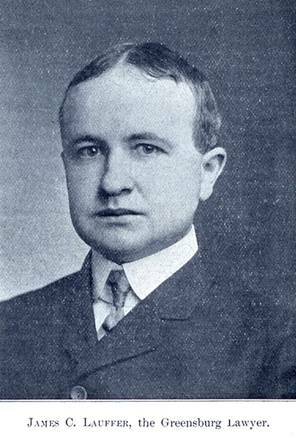 Elmer Hull Chambers, born Oct. 11 1883. William Homer Chambers, born Jan. 7, 1887. Lucinda Margaret Chambers, born June 30, 1890. (8) Leah Hartzell, daughter of Susanna Lauffer, the daughter of Henry Sr., the son of Christian, the Pioneer. Married to Henry Harshey. Four children. born Mar. 6, 1882, Harrison City, Pa. (e) Clara L. Altman, born Apr. 29, 1887, Harrison City, Pa.
(B) Amanda J. Harshey, daughter of Leah, daughter of Susannah Lauffer, daughter of Henry Sr., son of Christian, the Pioneer, was born Oct. 19, 1853. Married May 20, 1879, to Michael P. Baughman, of Adamsburg, Pa., by Rev. M. F. Lauffer. One child. Eva C. Baughman, born Aug. 13, 1888. N. Harshey, born June 28, 1893. (h) Lloyd C. Harshey, born March 19, 1898. 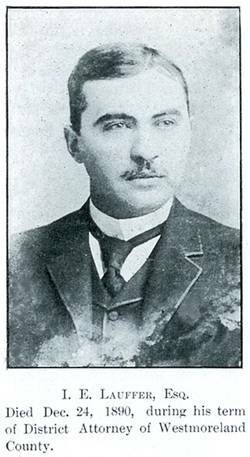 John F. Harshey is Post Master at Penn Station, Pa.
(D) George H. Harshey, son of Leah, daughter of Susannah Lauffer, the daughter of Henry Lauffer, Sr., the son of Christian, the Pioneer, was born Sept 21, 1856, married May 29, 1902, to Henrietta Ferree, by Rev. H. C. Calhoun, Turtle Creek, Pa.
1861, to Jacob W. Kemerer; died December 24, 1893; interred in Hill's Cemetery. Loammi Lauffer, born August 3, 1839; address, Irwin, Neb; served three years in Civil War; was there at final wind up; heard last angry gun fired on April 9, 1865. Ludid J. Lauffer, born November 14, 1858; died October 3, 1861 ; interred in Union Church Cemetery, near old home. Perry Ross Edminston, born October 29, 1903 ; died November 9, 1903. Zena Ellen Geiger, born June 29, 1903 ; residence, Nind, Mo. George O. Downing, born Oct. 4, 1875. Residence Bear Grove, Iowa. Family of Addie I. Downing, daughter of Anna S. Lauffer, daughter of George Lauffer, son of John, son of Henry, son of Christian Lauffer, born December 5, 1867; married October 6, 1889, to B. F. Reed, by Rev. W. Milhollin. To them was born one child, Neva D. Reed, April 6, 1891 ; residence Bear Grove, Iowa. Don C. Downing, born March 31, 1898; residence, Palisades, Colorado. George W. Downing, born September 12, 1901 ; residence, Palisades, Colorado. Family of Edith K. Downing, daughter of Anna S. (Lauffer) Downing, daughter of George Lauffer, son of John, son of Henry, son of Christian Lauffer, born February 2, 1873; married October 12, 1895, to Ellis Millhollin, by Rev. W. Millhollin. Maynard E. Millhollin, born April 26, 1902; residence, Bear Grove, Iowa. Family of Flora F. Downing, daughter of Anna S. (Lauffer) Downing, daughter of George Lauffer, son of John, son of Henry, son of Christian Lauffer, born September 15, 1883; married July 23, 1902, to Isaac Guy, by Rev. Ramsey. Charles A. Easterly, born May 10, 1573; married January 24, 1904, to Elsa Studeman; residence, Manning, Iowa. 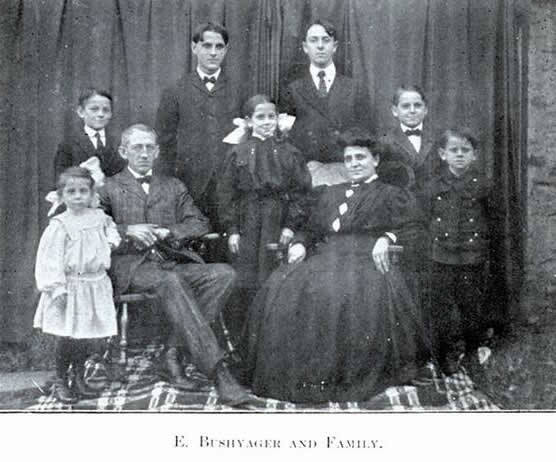 Family of Charles A. Easterly, son of Sarah C. Lauffer, daughter of George, son of John, son of Henry, son of Christian Lauffer, born May 10, 1873; married January 24, 1904, to Miss Elsie Studeman, by Alex. G. Bennett; residence, Manning, Iowa. was a quiet one, only a few relatives and near friends were present at the ceremony. Doctor Easterly came here from Carroll about two years ago and bought the dental business of Dr. C.. M. Boos and through his courteous treatment and fair dealing he has built up a very good business. He is a young man of good moral character and a hustler. the school house. The Monitor joins their many friends in extending congratulations. Mabel, born July 19, 1889. Clarence Downing, born August 15, 1899; residence, Marble, Colorado. September 20, 1892, to O. N. Millhollin, by Rev. W. N. Millhollin. To them were born one child, Lorren E. Millhollin, September 27, 1894. Residence, Guthrie Center, Iowa. Frances Louise Tracy, born September 18, 1903. Frank Hodgson, born December 21, 193; Residence, Redstone, Cal. 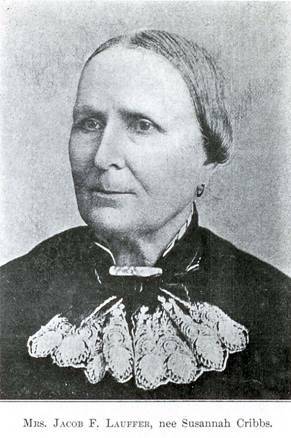 Anna Geiger, born 1847 (?) ; married to William Bair; died _________; interred at Apollo, Pa.
Charles R. Fisher, born May 24, 1878. Residence, Greensburg, Pa.
Nellie C. Fisher, born April 21, 1881 ; residence, United, Pa.
William Cline, born ; died aged about nine eyars (sic). Emmie Cline, born June I, 1880; (twins) died -; Interred at Putman Methodist church; funeral conducted by Rev. Simmons. Address, R. F. D. No. 2, Carpenter, Ohio. Family bf Elizabeth Cline, daughter of Mary (Lauffer) Cline, daughter of John Lauffer, son of Henry Lauffer, son of Christian Lauffer, the Pioneer, born July 29, 1847; married June 13, 1876, to William Henninger, by Richard Doughty. To them was born one child, Mary M. Henninger, June 30, 1877; married November 18, 1902, to John Andrews; residence, Zaleski, Ohio. To John Andrews and wife was born one child, Elizabeth Andrews, April 27, 1903. Address, Zaleski, Ohio. 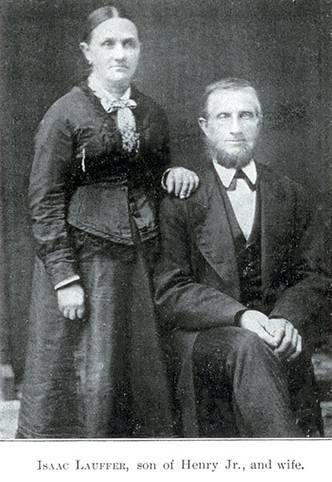 Family of Matilda Cline, daughter of Mary (Lauffer) Cline, daughter of John Lauffer, son of Henry Lauffer, son of Christian Lauffer, the Pioneer, born November 15, 1854; married September 16, 1894, to John Ward, by Squire Robt. S. Barnhill. To them was born one child, Anna L. Cline, May 8, 1875; married Sept. 7, 1894, to Milton Ankrom. Address, Royal, Ohio. 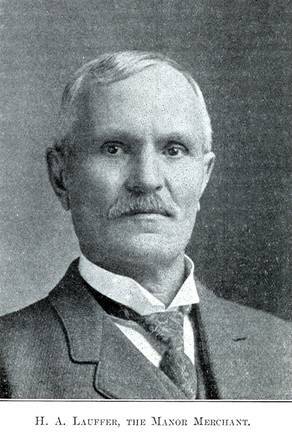 Jeremiah Hill, born February 11, 1836 ; address, Holton, Jackson County, Kansas. Joseph Hill, born December 21, 1838; married September 5, 1861, to Elizabeth Baum; residence, Ridgeway West Virginia. 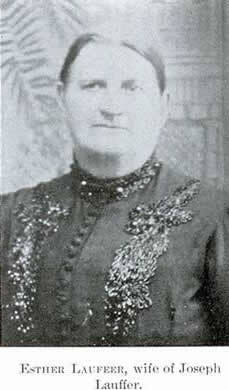 Mary A. Hill, born July 16, 1863 ; married March 16, 1890, to Charley Walters; residence, Los Angeles, Cal. Ida M. Hill. horn October 9. 1874: married September 30, 1896, to Harry Stewart; residence, West Virginia. Rilla Jane Brinker Hill, born April 28, 1884; residence, Manordale, Westmoreland County, Pa.
Clarence A. Remaley, born March 23, 1886; residence, Sardis, Pa.
Violet Verneta Remaley, horn June 25, 1903; residence, Sardis, Pa.
Malinda Lauffer, born January 4, 1863. Lydia Malinda Truxal, born February 26, 1887. Family of Susan E. Lauffer, daughter of Henry, son of John, son of Henry, son of Christian Lauffer, the Pioneer, born September 16, 1850; married December 18, 1879, to A. J. Schaff, by Rev. B. B. Ferree. Her husband, A. J. Schaff, was killed June 14, 1884, at the age of 30 years and 29 days. He was interred in old German cemetery and later on removed to Hillview Cemetery. Saturday, in which A. J. Shaft, a brakeman on the local freight of which Theo. Butterfield, of this place, is connected, is the victim. Mr. Shaft was standing on one of the cars with his face turned toward the rear of the cars and had evidently forgotten of the near approach to his death trap, the Paintersville bridge. He was struck on the back of the head by one of the binders of the bridge and knocked forward on his face on top of the car. He survived for a few minutes, but died before reaching the next station. His head was cut very little, but his neck was broken. His remains were brought to his home in Rohrertown on Saturday afternoon and interred in the German cemetery on Sunday at 3 p.m. He was a member of the St. Clair Lodge, No. 53, A. O. ,U. W., and of the Knights of Pythias.- Greensburg Press, June 16, 1884. Susan E. Shaff, widow of A. J. Shaff, was married on Aug. 14, 1890, to George S. Trice, by Rev. W. F. Olaham. To them was born one child, William P. D. Trice, born March 8, 1891 ; residence, Greensburg, Pa.
john S. Trice, born June 10, 1888, United, Pa.
Edna Malinda Trice, born October 30, 1895. Sarah Susan Lauffer, born April 14, 1888; Died an infant. Carl Adam Lauffer, born March 26, 1903; died March 27, 1903 : interred in Hillview Cemetery. Family of Cora A. Lauffer, daughter of William Lauffer, son of Henry, son of John, son of Henry, son of Christian Lauffer, the Pioneer, born August 18, 1882; married September I5, 1903, to H. H. McDowell, by Rev. Stanley L. Krebs. Annie Mary Lauffer, born December 1, 1863 ; married October 20, 1888, to Harve Cunningham; residence, Apollo, Pa.
born May 22, 1545; married to Daniel Spencer; residence, Ford City, Armstrong County, Pennsylvania. Two children were born to them, both of whom are dead. Family of Jesia Lauffer, son of Jacob Lauffer, son of John, son of Henry, son of Christian Lauffer, the Pioneer, born January 4, 1849; married November 25, 1900, to Mary Ford; Address: Apollo, Pa.
Lillie M. Slumberger, born October 19, 1875; died October 16, 1883. 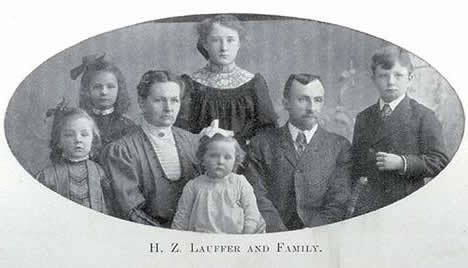 Family of Henry Lauffer, son of Jacob Lauffer, son of John, son of Henry, son of Christian Lauffer, the Pioneer, born September 3. 1859; married June 28, 1901, to Jennie Coup. To them was born one child, Roy Coup Lauffer, born April 1, 1903. Elizabeth Lauffer, nee Spence, of Greensburg, Pa., was born Dec. 15th, 1839, in Indiana, Pa.; was married to William Lauffer, June 20th, 1861 ; and died Sept. 8th 1905. Aged 64 years, 8 mo., 23 days. Lived opposite Apollo until 1889 when she and her husband moved to near Harrison City, Pa., and after her husbands death moved to Greensburg, Pa., where she spent the last years of her life. She was a consistent member of the Denmark-Manor Reformed Church and a loving mother. BRIEF SKETCH OF WILLIAM LAUFFER. William Lauffer was born in Mount Pleasant Township, Westmoreland County, Pa., Nov. 6th, 1824. A few years later his father and mother moved to Manordale, Franklin Township, Westmoreland County, Pa., where he spent the early years of his life in the persuit (sic) of farming and working on a saw-mill. 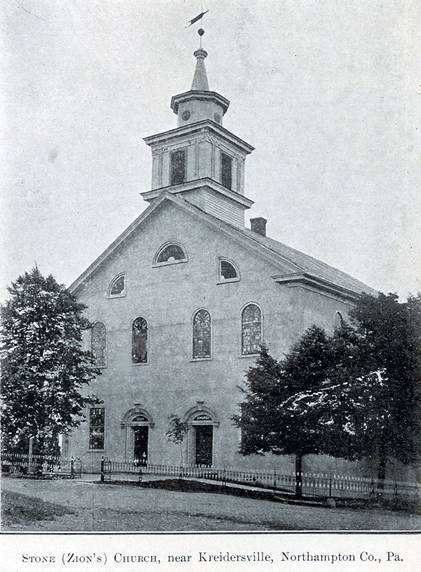 Early in life he was baptized by Dr. N. P. Hacke, and when he had arrived at the age of thirteen years, he became a full Communicant member of Emanuel German Reformed Church. In the Spring of 1852 he purchased a farm of George McCreary, opposite the town of Warren, now Apollo, in Allegheny Township, Westmoreland County, Pa., and moved to it in the Spring of 1853, where he continued the persuit(sic) of farming, and in the Spring of 1889 he moved to the David Yount farm near the scene of his early boyhood days in Penn Township, near Harrison City, Pa., where he passed the remainder of his days. He was married to Elizabeth Spence, of Apollo, Pa., June 20th, 1861, by Rev. Robert McMillan. He was an industrious, prosperous, honest, upright, Christian father, a good citizen and a consistent member of the German Reformed Church and in his declining years attended the Denmark Manor Reformed Church, where he lies buried alongside the church in Woodlawn Cemetery. In Politics he was a stalwart Republican; but in local elections the best man always received his vote. had a host of friends. He had established an undying reputation for honesty and was held out as a worthy example. His neighbors, who knew him best, were accustomed to say to each other, "You should be as honest as Billy Lauffer," as he was familiarly called. In loving remembrance of William Lauffer, who died Dec. 29th , 1898, aged 74 years, 1 month and 23 days. Its pain, its sorrow, and its toil to share. William Harvey Cunningham, born January 27, 1903; address, Apollo. Pa.
Lillie Annetta Lelles, born August 13, 1893; died Nov. 10, 1903. Gertrude Lucella Lelles, born July I5, 1903. Family of William Lauffer, son of John, son of Henry, son of Christian Lauffer, the Pioneer, born November 6, 1824; married June 20, 1861, by Rev. Robert McNellon, to Elizabeth Spence, who was born December I;, 1839; residence, Greensburg, Pa.
James C. Lauffer, Attorney at Law, of Greensburg, Pa., was born Nov. 10th, 1873, in a log house in Allegheny Township, Westmoreland County, Pa., opposite Apollo, where the town of Vandergrift Heights now stands. 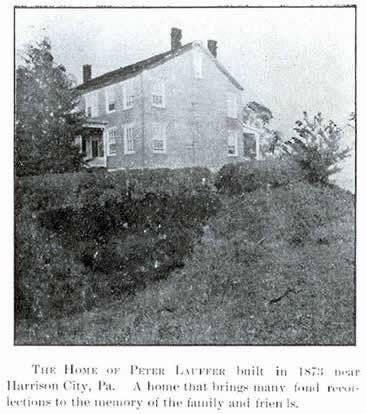 It was here that he spent the early years of his life helping his father on the farm and attending Evan's school in the winter, until in the Spring of 1889 he moved to Penn township, near Harrison City, Pa.. where he continued helping his father on the farm in the summer and attending Holtzers school in the winter. In January 1891 he entered the preparatory department of the Greensburg Seminary. Entered Heidelberg Uuniversity (sic) at Tiflin, Ohio, in the Fall of 1892; graduated from the Ohio Normal University in the Summer of 1897. Otterman street, Greensburg, Pa., with Charles K. McCreary. He was married to Amanda Carpenter Sherrick, of Mount Pleasant, Pa., July 27th, 194, and this union was blessed by one son, James Sherrick Lauffer. He was instrumental in organizing the Merchants Trust Company, of Greensburg, with a capital of $200,000.00; of which he is a director, and is Secretary of the Greensburg Realty Co.
Lilly Spence Lauffer, born March 18, 1877; married December 24, 1902, to Dr. Frank L. Swallow, by Rev. Evans ; residence, Greensburg, Pa. Infant daughter, born September 11, 1898; died September 11, 1898; all interred at Denmark Manor, Wood Lawn Cemetery. one child, Frank Lauffer Swallow, September 27, 1903. The death of Dr. Frank Lewis Swallow has cast a gloom over Manor, as it takes away a kind father, a faithful and devoted husband and a most generous and affable citizen. Let those who knew him best testify to his. sterling worth and his memory will be kept green for many years. ago. His brothers, Harry, of Lambertville, and Charles, of Trenton, are prominent citizens. The deceased was the youngest of the family. The deceased entered the public schools of his native town and made the remarkable record of graduating from the High School at the age of 13 years. It is said of him that he was the only pupil that ever graduated there in knee pants. He entered the University of Pennsylvania and graduated from that celebrated intstitution (sic) in 1900, at the remarkable age of 24 years. He was appointed by the P. R. R. for the Pitcairn division, as examining surgeon and held this position at the time of his death. He was a skilled musician. He played in Sousa's band, belonged to some of Philadelphia's finest orchestras and won distinction in this line. He was married to Miss Lillie Spencer Lauffer, of Greensburg, Pa., in 1902, and this marriage was blessed by the birth of a bright ,boy baby, now only seven weeks old. To his wife and baby boy he was most devotedly attached. The death chamber is a singularly sad, one and when the writer, bn old acquaintance of the family, visited it this morning, he found the bride of a year ago prostrate in grief and the gray haired grandmother (sic) fondling her little grandson, whose young and gifted father was coffined for the tomb. The cause of death was evidently overstudy. A worshipper at the shrine, he gave his Deity too much devotion and his death was due to physical collapse. His death is another instance, where genius and energy are wedded in the body and mind of a single individual. He was a most genial and companionable man, a devoted husband and father, and the sympathy of all goes out unstintingly to the bereaved in this hour of dire affliction.- Greensburg Tribune. Pioneer, was a successful farmer, a prominent member of the Reformed church in which he held the offices of elder and deacon for many years. He was a man of commendable characteristics, being known among his neighbors as Honest Peter.. In politics he was a staunch Republican, but never aspired to public office. Early in life he purchased a farm in Penn township, Westmoreland County, Pa. The farm contained about 138 acres, and was in rather poor state of cultivation. He was frequently told by his neighbors and friends, that he could not make a living on such poor land. Peter, however, had the courage and went to work with a will and soon brought into evidence his ability as a business man and a farmer . In the year 1873 he erected a large brick house on the farm and surrounded it with an evergreen fence, which, together with many other improvements, is still standing as a witness to his untiring efforts, though now being owned by Wm. Wagner. For none of us liveth to himself, and no man dieth to himself. For whether we live, we live unto the Lord ; and whether we die, we die unto the Lord; whether we live or die therefore we are the Lords. For to this end Christ both died and rose and revived-lived again-that he might be Lord both of the dead and living. Romans 14 :7, 8, 9. Extracts from a sermon preached at the funeral of Peter Lauffer, who died August 4, 1886, interment in Emanuel Cemetery, August 6, 1886.
to know and love Christ. For some years .he transferred his church membership to a neighboring congregation, but to this Zion of God-this childhood home of his soul and spirit, around which memories clustered, which will live forever, his eyes and his heart ever turned. The poet expresses the sentiments and feelings of our beloved brother for this house of God and all its surroundings in that beautiful hymn. With these sentiments animating and ruling his heart, he labored early and late, nobly and heroically to make this spiritual home, this church-God's acre, where peacefully his remains will sleep until the resurrection, now beautiful and lovely. The beauty, attractiveness and loveliness of this sacred spot is due to oar departed brother, and others, who like him, labored, toiled, prayed, and gave largely of their means, time and substance, to adore and beautify this hill of God, and make this temple- the place where God's name is recorded and where his honor dwelleth glorious. No one gave more towards the rebuilding of this temple. No one gave more willingly or cheerfully. And none were more faithful in their attendance on the regular preaching of the word, the ordinances of the church, and the congregational meetings, having for their object the advancement of God's Kingdom in our midst. Our departed brother began life with scarcely a dollar. Industrious, full of zeal and energy, God blessed and prospered him. He accumulated a comfortable home and a goodly inheritance of honest toil, hard labor, and the sweat of his brow. Whilst he was diligent in business he was at the same time fervent in spirit serving the Lord. He always gave liberally and cheerfully unto the Benevolent objects of the church. God loves the cheerful giver. In this regard, as well as a faithful member and deacon of this congregation, we will all miss him. As a good man and neighbor the community will miss him, but above all as a tender husband and a kind and loving father will be missed by the bereaved household and family. Better, however, ten thousand times better that we are missed, even sadly missed in the church, congregation community and family circle than otherwise. In this there is the evidence and the proof that we are filling, in some measure at least the sphere and place into which God put us. Speaking to me some time ago of the disease which was terminating his earthly life, he remarked that he was dying differently from what he thought he would. He said, be expected to die suddenly. His departure was in accordandce (sic) with the teaching and truth of the text. We die according to the way, manner and circumstances, as God directs and wills. "We die unto the Lord." But how did our departed friend and brother die? As he lived. "Unto the Lord.'' In the providence of God. I was permitted to be at his side, commend his soul into the hands of our kind heavenly Father, and close his eyes in death. He as perfectly conscious to the last moment, and departed as calmly and peacefully, as the child falling asleep on its mothers bosom. So gently did he fall asleep in Jesus, that it could scarcely be seen just when the earthly life terminated and the heavenly was ushered in. How gently heaves the expiring breast." And breathe my life out sweetly there." How comforting also are the words of the text to the bereaved household, family, relatives and friends. You are God's property, God's possession. He has bought you each one with a price not with corruptible things, as silver and gold, but with the precious blood of Christ, as a lamb, without blemish and without spot. We belong unto him in soul and body, in life and death. He is your shepherd. He will provide for and take care of you, and you shall not want. The same God and Father, that led, preserved ,defended and provided for his Israel of old will care for you. The same Savior that comforted a Mary and a Martha will comfort you. He says, "Let not your heart be troubled, neither let it be afraid etc." "I will not leave you comfortless.'' Trust Christ. Bring your sorrows,, tears and broken hearts to him. "Come unto me all ye that labor and are heavy laden and I will give you rest." There are solemn lessons for us to be learned as a congregation and a community. Do we realize that we are Gods property, that he has bought us with the infinitely availing blood of his own dear son? In virtue of this precious purchase price we belong not unto the world nor the evil one, but unto Christ. If we realize that we are God's property we will have the mind and spirit of Him, who has fully satisfied for all our sins, and made us heirs of God and joint heirs with Himself. We will live unto God in a peculiar Christian sense. We will glorify God with our bodies and spirits which ate his. If we are not Christ's, and not living unto the Lord, whose fault is it? Can we come before God now, and in the great last day and tell him that He never bought us? Is there a soul here to-day, who is making null and void this effecacious(sic) purchase by neglecting and refusing to live unto him ? And this Thy grace must give." Infant daughter died Jan. 16, 1854, interred at Denmark Manor ; later removed to Hill's Cemetery. Joseph A. Lauffer, born May 10, 1870; married January 1, 1904, to Miss E. C. Bridenthal: address, Greensburg, Pa., 70 West 2nd street ; One child, Grace Mildred, born Feb. 9, 1905. 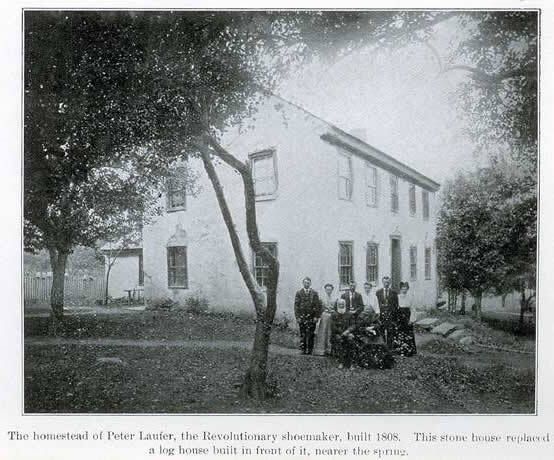 The fifth son of the generous hearted Peter Lauffer was reared on the home farm near Harrison City, Pa. He received a good education, and at the age of 21 he engaged in the grocery business in Greensburg, Pa., which he has pursued ever since. He is a staunch Republican and a member of the First Reformed Church of Greensburg, Pa., taking an active part in Sunday school and general church work. Having served as treasurer of their C. E. Society and Sunday school for 13 years. For nearly 4 years he has not been absent from Sabbath school a single Sabbath. Anna M. Lauffer, born September 25, 1871; married September 29, 1892, to Calvin P. Ashbaugh; address, Irwin, Pa., R. F. D. No. 2. Infant daughter died may 11, 1874 interred at Denmark Manor, later removed to Hills, cemetery. Infant, born December 19, 1905 ; residence, Nihil, Pa.
Family of Sarah E. Lauffer, daughter of Peter Lauffer, son of John, son of Henry, son of Christian Lauffer, the Pioneer, born April 5, 1859; married June 27, 1878, to Reuben H. Kemerer, by Rev. J. F. Snyder. To them were born the following children : - Residence, S. Greensburg, Pa.
Family of Lizzie J. Lauffer, daughter of Peter, son of John, son of Henry, son of Christian Lauffer, the Pioneer, born January 2, 1864; married January 18, 1883, to William H. Kemerer, by Rev. Jacob F. Snyder. William H. Kemerer was born March 2, 1853; residence, New Stanton, Pa.
Joseph Eugene Lauffer, born April 24, 1903.
farm he grew to manhood without being exposed to the vices that belong to idleness. He helped his father in the summer and attended the district school in the winter. He never knew the value of a mother's love, his mother dying when he was but six years old. His father died when he was eighteen, leaving Henry to shift for himself. He proved himself equal to the emergency and for two years worked for his brother, receiving $10.00 per month in the summer and his board in the winter. The third summer he secured work with a cousin, Simon Trice, and at the expiration of his time attended the Greensburg Seminary. He entered Duff's Commercial College, where, in order to pay his way he worked in an office for $5.00 a week. He diligently pursued his studies in the evenings, graduating with honor. After completing his course he accompanied one of his teachers, Prof. Thompson, whose health had failed, to Wilmerding, and clerked in his grocery. He remained with Mr. Thompson until the latter disposed of his business when he worked for Snyder Bros. during the illness of a clerk. Having nothing in view he accepted an offer to carry papers for William Adams, a news dealer, receiving very meager pay. But soon John R. Montgomery, a Turtle Creek merchant, found a place for Mr. Lauffer in his office and store, where he remained sometime. On April 23, 1891, Mr. Lauffer was united in marriage with Miss Mary E. Hill, a dress maker of Wilkinsburg. Having been working on very small salaries since leaving college, he conceived the idea of becoming a dress maker. With him to think, was to do, and soon he became quite proficient in the art. Later he secured a position with Johnston Bros., at Wilkinsburg, remaining two years. He also spent two years as head book-keeper for a wholesale confectionery company, of Pittsburg. July 31, 1901, to accept a position as chief clerk to the Hon. John H. Brown, who was appointed Controller of Westmoreland County, by the Governor. This position he held for a term of three years, filling it very acceptably. Soon after leaving the County Controllers Office, he was elected assistant Cashier of the Jeannette National Bank, which position he now holds. Mr. Lauffer is an expert accountant, a careful business man and has hosts of friends. He resides with his wife and children in a pleasant country home, near Jeannette. REUNION SUCCESSFUL DESPITE HEAVY RAIN. Although the ugly weather of Saturday kept many from attending the Lauffer reuion(sic) at the home of Deputy Controller, H. Z. Lauffer, Penn township, 275 people were present and a very enjoyable time was had. Owing to the absence of Rev. Frank E. Lauffer, of Aaronsburg, the program could not Be carried out as published. Short addresses were delivered by Rev. J. M. Evans, of Harrison City, Rev. C. E. Wagner, of Delmont, Rev. J. N. Bauman;, of Jeannette, and Rev. J. F. Snyder, of Salina. Good music was rendered by the Knobloch orchestra, Greensburg. At noon an elegant dinner was served on tables in the barn. General regret was expressed that the venerable John Lauffer, of Harrison City, was unable to be present as the guest of honor. It will be recalled that on January 26, Mr. Lauffer celebrated his one-hundreth birthday anniversary. Ethel Margaret Lauffer, born March 26, 1903. Family of Joseph A. Lauffer, son of Peter, son of John, son of Henry, son of Christian, the Pioneer, was born May 10. 1870; married January I, 1904, by Rev. C. R. Dieffenbacher, to Elizabeth C. Bridenthal, who was born October 24, 1880 ; residence, 70 West Second street, Greensburg, Pa. To whom was born one child, Grace Mildred, February g, 1905, address Greensburg, Pa.
Lauffer Family Spend Delightful Day Near Harrison City. 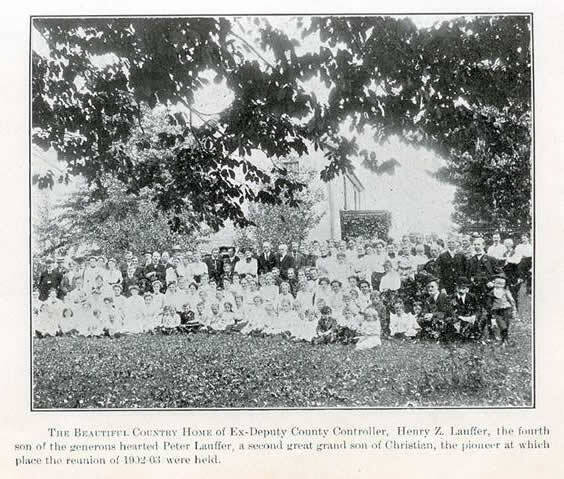 The annual Lauffer reunion was held at the home of C. P. Ashbaugh, two miles northwest of Harrison City, and was one of the most successful yet held, nearly 200 people being present. All brought well filled baskets, the contents of which were spread on eight tables, arranged in the large barn floor. After the blessing was offered by the Rev. Frank Lauffer, of Aaronsburg, full justice was done to the feast. latter a few days before she died expressed her desire to attend this reunion. Another death was that of Mrs. Philip Lauffer, at whose hospitable home the first family reunion was planned and held 15 years ago. She might well be called the mother of the Lauffer reunion. These vacant places caused much gloom to pervade the assemblage. A vote of thanks was tendered Mr. and Mrs. Ashbaugh for their hospitality and courteous treatment of the relatives and friends. Among the relatives present from Greensburg were: George Trice and family, James C. Lauffer and Joseph, Lauffer and family. Minnie M. Lauffer, born April 15, 1883. Roy Emerson, 'born January 3, 1906 ; residence, Harrison City, Pa.
Family of Minnie May Lauffer, daughter of Peter Lauffer, son of John, son of Henry, son of Christian Lauffer, the Pioneer, born April 15, 1883; married April 30, 1902, to Andrew Baughman, by Rev. George J. Diener. Sarah E. Kemerer, born September 20, 1865 ; married Mar. 16, 1887, to Morrison J. Bush. Maggie Kemerer, born June 12, 1896 ; residence, Export, Pa.
Nevin B. Kemerer, born Mar. 6, 1881 ; married, April 29, 1903, to Mary Watson, residence, Export, Pa. 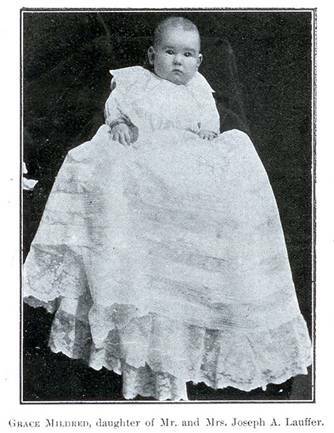 Infant baby, no name, June 29, 1905. Harry Snyder Sadler, born August 31, 1893. Laura K. Hutton, born June 7, 1889. Bert E. Hutton, born July 20, 1897. Lloyd Irvin Bush, born June 8, 1901 ; address, Delmont, Pa.
Family of Lydia Lauffer, daughter of John, son of Henry, son of Christian Lauffer, the Pioneer, born July 27, 1831 ; married August, 1861, by Rev. N. P. Hacke, to Jacob W. Kemerer, who was born July 24, 1832. 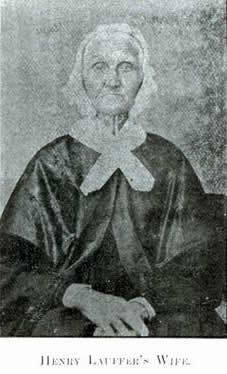 Near, Manor Dale, Pa., December 24, Mrs. Lydia Kemerer, aged 62 years, 4 months and 27 days. The deceased had been afflicted for a number of years with asthmatic and dropsical troubles. La Grippe set in and in one short week terminated her earthly life. In infancy she was baptized by Rev. Winch and confirmed by him in the sixteenth year of her age. She was a communicant member of the Emmanuel congregation for 45 years. Like her daughter, Mrs. Steele, who died a few years ago, she left a legacy, the interest of which is to be usd (sic) in keeping the God's acre in which her body reposes beautiful and in order. By that legacy, though dead, she yet speaketh. "Arise ye and depart, for this is not your rest." For the Reformed Church Record. Departed this life, June 10, 1890, Mrs. Emma J., wife of Elmer Steele, and daughter of Jacob W. and Lydia A. Kemerer, aged 26 years, 7 months and 9 days. this new and sore bereavement, but by the grace of God she gave it up without one murmuring word. Stricken down by fever, her illness was of short duration. The messenger came suddenly, but did not find her unprepared. Months before she departed, while in her usual health, she had set apart a sum of money for keeping in repair the beautiful God's acre in which her body now sleeps. By her earnest Christian life, her faithfulness and devotion, her legacy to the church, what a memorial she reared, more enduring than granite or marble! "Soldier of God, well done ! Clara Idela Kemerer, born May 25, 1867; residence Wilkinsburg, Pa.
Hacke N. P. Kemerer, born April 21, 1869; residence, Turtle Creek, Pa.
Malinda Kemerer, born March g, 1872 ; residence, Wilkinsburg, Pa. The relatives and friends of the late Anna Mary Kemerer gathered on Thursday afternoon at the home of Jacob Kemerer, of Franklin township, to pay their last respects to his departed daughter, whose death was previously mentioned in these columns. After brief service at the house the mourners repaired to Hill's church. Notwithstanding the bad roads and inclement weather the cortege was nearly a mile long. Have engulfed our happy home. Centered all dear love, in you. Comes with healing and relief. That for us you wait above." Anna L. Kemerer, born April 18, 1877; residence, Wilkinsburg, Pa.
Ira Edward Kemerer, born October 17, 1902; residence, Turtle Creek, Pa.
Wilber Lawrence Kemerer, 'born March 20, 1904. Another name is stricken from the list of attorneys, and a Bar popular for the brilliancy of its members, mourns the loss of a shining light. At two o'clock this morning, December 24, District Attorney I. E. Lauffer breathed his last. His death was not unexpected, as the disease was of such a character as to leave little, if any, room for hope. We have said that he was dying, and our readers, no doubt, expected the end. It come and overshadowed, with a cloud of grief, the festivities of the usual Christmas joys. 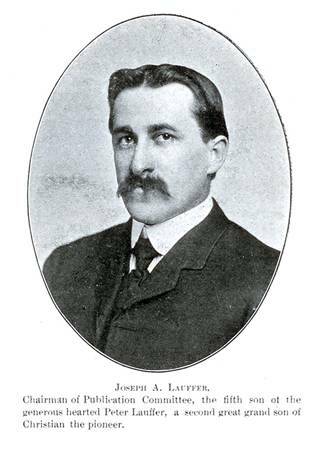 I. E. Lauffer was born Jan. 3, 1860, near Murraysville, Westmoreland county, and was a son of Joseph and Esther (Berlin) Lauffer. His early life was spent on his father's farm. Entering the common schools he soon manifested a desire to learn, and not content with the advantages they afforded, he expressed a desire to attend higher institutions of learning. When Professor G. H. Hugus, our present superintendent, took charge of the Delmont academy, Mr. Lauffer, then a mere boy, walked from his father's home to Delmont, a distance of four miles, to attend school. He had the energy that wins. them that their love was reciprocated, as the deceased often spoke to us of their kindness. Five years ago, in 1885, he was admitted to the bar and clients seemed to be waiting for the event. He soon gained a large practice. He was a natural lawyer. Common sense is the most powerful element in his profession and he worshipped at its shrine. He was always equal to the occasion. In 1889, he was the choice of his party for District Attorney and a colleague on the ticket with L. W. Doty, Esq., and Mr. Lucien Clawson. It is admitted that this ticket was one of the strongest ever presented to the people of Westmoreland county, and it overwhelmingly triumphed at the polls. On the beginning of the present year, Mr. Lauffer was sworn into office and conducted the affairs of the Criminal Court in a manner highly satisfactory to the people. We feel that the public was conscious of his usefulness and it is needless for us to add any words of praise. At the close of the November term of Criminal Court he took ill, and his illness developed into typhoid pneumonia. Every thing possible was done for him. He had the most careful nursing, and seemed on a fair way to recovery. A relapse took place; and he rapidly sunk until death came to his relief at the time stated. His funeral will take place on Friday from the residence of his father, in Franklin township. Services will be held tomorrow at 10 o'clock in Zion's Lutheran church, this place. fees. Others may be as great in the knowledge of the law, but it will be a long time before one is found who will be more faithful or more successful in the office left vacant by his death. In addition to. this he was eminently a social and kind-hearted man. He was generous in his judgment of men in extending aid to those who were needy. His sterling qualities attracted to him a large following of devoted friends. In this respect he was exceptional, the most incongruous elements uniting in his support. "District Attorney I. E. Lauffer read law with me. He was a very faithful and industrious student and seemed to drink in the law. Frequently T cautioned him not to overwork himself, but he became so wedded to his studies that a text book was never out of his hands while in the office, as well as, I have every reason to believe, in his private chamber. He was a young man of sterling integrity, as honest and as pure as the best piece of steel. There was no hypocrisy about him. He was what he was and that only. At first there was a shade of doubt in my mind as to his final success at the bar owing to his modesty and, as I thought, retiring disposition, but before he closed his studies, this thought was dissipated, knowing that labor would bring its own reward and in addition thereto when he came to the bar I was confirmed in my belief that he would prove a success in his profession. "Mr. Lauffer vas a man of the purest morals. I never knew him to say a word or do an act inconsistent with that of a Christian man. Both myself and family became warmly attached to Mr. Lauffer, whose death was most deeply deplored." That thou shouldst die before thou hadst grown old?" It is so natural to expect that they who are taken to their last resting place should first come nigh unto three score years and ten. Death seems to belong as little to youth as darkness to the earlier hours of day. In the forenoon of life we not only hope for the usual length of time ere the sun set, but also for the deeds and achievements to which this time gives opportunity. And our hearts are startled with sad surprise when this hope comes to an end with the announcement that "the young man is dead." An illustration of this is now before us. Mr. I. E. Lauffer would only have been thirty-one years of age had he lived till the 3rd of next month. Only one score and ten years, instead of three score years and ten l Only three of the seven stages passed! The regret is universal that he should have died so young. Men everywhere give expression to this regret in tones that are vibrant with profound sympathy, and the saddest of it all comes out in so much stronger contrast as it looms up beside the pleasures which cluster about this season of the year. In a short time the remains of how departed friend will be on their way to the chill darkness of the grave, while the living are gathering to the glad festivities of Christmas. In looking back over the life that is gone, we find much even in its one score years and ten, to admire and to hold in loving remembrance. A sturdy faithfulness to duty has always characterized the departed. They can bear testimony to this who have cared for him from his earliest days. And, even if we had not the testimony of his parents, we would be able to judge of this from his record in Greensburg. For it is not possible that such a manhood could spring from anything but a child-hood well trained, obedient and faithful. "Of thorns men do not gather figs, nor of a bramble bush gather grapes ;" and of an indifferent childhood they cannot gather a real, manly character. How can a stream rise. higher than its fountain? From what we know of Mr. Lauffer, we are sure that the fountain of his career was high up in the sphere of piety and prayer, and as near to a life in Christ as the hands of a Christian parental example and an early consecration to God could lift him. He was faithful as a student in the academies at Delmont and Murraysville, where he received his preliminary training for the work of coming years. Of this we have evidence in his excellent mental training. His insight into the varied problems of his profession was clear; and this indicates the highest ability, if Carlyle's saying is correct, that "insight is power." A stranger could easily have misjudged him. His appearance was of extreme modesty, and, in disposition, he was rather retiring. But back of that quiet exterior, was a mind as strong as the unseen current that flashes its message from land to land. Back of it was an intelligence that lit up the subject before him as dearly as the sunbeam that drops in silence upon the earth. Back of it was a judgment as true to the right as a magnetic needle to its pole. But to this, aside from his natural gifts, he could not have attained had he been unfaithful or a sluggard, in his educational course. God had given him a good mind-excellent natural gifts, without which it would have been impossible to reach the position he held; and through these he might easily have been tempted to the indolence that has ruined so many. But indolence was foreign to his character at all times; for without steady industry , he could no more have gathered the fruits that clustered about him during these last few years, than one can reap a harvest from an unsown, though fertile field. His talents were in great part those which are developed by hard work. gets more of life's truest blessings than that which he pays for; and what greater blessing is there than that of having the affection of those with whom one is laboring? But to receive this, one must pay for it with affection in return, and, if we judge of Mr. Lauffer by this standard, his must have been a heart of more than ordinary love and kindness. Only in this spirit can a man i truly faithful, whether it be to himself or to others; for with it he has a power that fairly lifts and impels him to the doing of his duty. The time came that he entered upon the study of law, his chosen profession. His friends had doubts at first as to his success in this line. The quiet modesty with which he made application to his future preceptor would, in these days of general self-sufficiency, make almost anyone hesitate as to the fitness of fie applicant. It is so unusual. We somehow expect everyone to sound his own praises, and to make as striking a first impression as possible. He came to his preceptor quietly; he did his work quietly: he succeeded quietly; and quietly, but with every promise of an enviable future, he took his place among a class of men of this town whom it is far from easy to compete with. A young lawyer has far to travel before he can stand beside the best of his profession here. But Mr. Lauffer was fast striding toward the front. His colleagues have admitted this. And the force that sent him forward was generated in those quiet hours of Intense study under the supervision of his able preceptor. Although the announcement of District Attorney Lauffer's death was not an unexpected one, yet I must confess that it truly was a sad one. From the frequent newspaper notices relative to his condition I gathered the information that his recovery was well-nigh impossible. But now to realize that one so young, so industrious and so truly destined, humanely speaking, to achieve greatness and helpfulness is laid low in .the embrace of death, is a faithful reminder that before the onward sweep of the destroying angel all mortals must sooner or later fall. My acquaintanceship with Mr. Lauffer runs back in years of his boyhood days, and I can truthfully say that my most vivid recollections of him and his steady onward course convince me that, in honesty of purpose, integrity of character, and in nobility of soul, he was as true to all as the needle to the pole and "righteousness to the plummet." Of an unassuming disposition he nevertheless attracted the considerate attention of the many with whom he associated. There was something about him that drew one almost unconsciously near to him. Considerateness was a chief characteristic in his general makeup. It was his principal aim to find the right path, and then to walk unswervingly along the same. He was not ashamed to seek counsel, and I remember distinctly when he came to me as his friend and former pastor, and sought what little advice I was humbly able to furnish. When he believed that he was right, no alluring or time-serving compensation was great enough to draw him aside from the path of rectitude and duty. In disposition he was as affable and kind as the most tender-hearted woman. To injure, by thought, word or deed, the lowest of earth's multitude, was the act remotest of his being. Then he was a particularly humble man. A self-bolstered popularity and pretentious worth found no place in his manly deportment. my heart feels sad that my young and prized friend has left us, still I bow in humble submission to Him who doeth all things well. And when the inscription in the granite block that may mark the resting place of his earthly remains, has been effaced by the corroding finger of time's elements, and even when the recording tablet itself has mouldered into dust, there will remain, in the hearts and memories of his friends, the imperishable epitaph, "I. E. Lauffer, the honorable, 'the useful, the upright, and the Christian young man." Touching Words by His Honor Judge Doty. it proceeded from a naturally amiable disposition and kindness of heart. He died young, but lived long enough to accomplish much good and to give promise of still greater usefulness in the future. The little world in which he lived paused a moment when Lauffer died, and unusual sympathy and regret were heard on every side. But the times are too busy to long pause. Practical duties demand the attention of living men. No one is absolutely essential in any sphere of activity. We take our turn and play our part and move on to make room for others pressing after." Gerusha J. Lauffer, born June 15, 1861 ; married November 24, 1887, to S. J. Duff; residence, Manordale, Pa. Died June 28, 1905. Sarah L. Lauffer, born May 28, 1863 ; married February 22, 1900, to W. G. Kline; residence, Manordale, Pa.
Mehalah J. Lauffer, born April 27, 186j; married May 22, 1891, to George Geiger; died October 31, 1897; interred at Hill's cemetery. Mary A. Lauffer, born June27, 1867; married October 20, 1892, to J. W. Soles; residence, Export, Pa.
Ida C. Lauffer, born January 20, 1870; married February 25, 1897, to W. J. McGrinn ; residence, Export, Pa.
J. Fink Lauffer, born February 15, 1872; married June 16, 1898, to Alice P. Jenkins ; residence, Export, Pa.
E. B. Lauffer, born April 5, 1874 ; residence, Export, Pa.
Bertha M. Lauffer, born March 22, 1876; married February 14, 1895, to Ira Alexander; residence, Export, Pa.
Family of Gerusha J. Lauffer, daughter of Joseph Lauffer, son of John, Jr., son of Henry, son of Christian Lauffer, the pioneer, born June IS, 1861; married November 4, 1887, to S. J. Duff, by C. L. Halloway. Died June 28, 1905. Infant child (dead born) May 17, 1901 ; interred in White Valley cemetery. Elias L. Kline, born December 15, 1903. Israel E. Geiger, born October 19, 1891. William H. Geiger, born April -, 1893. Joseph F. Geiger, born January 21, 1895. Harry W. Soles, born November 3, 1893; died August 4, 1894 ; interred at Export, Pa.
Hazel J. Soles, born August IS, 1895. Olive M. Soles, born December 30, 1900; died April 14, 1901 ; interred at Export, Pa.
Elery David Soles, born April 4, 1904. Emery Joseph Soles, born April 4, 1904. Josephine E. McGinn, born January 16, 1899; residence, Export, Pa.
Eliza M. McGinn, born April 28, 1901 ; residence, Export, Pa. Infant daughter, born April 28, 1903 ; died April 29, 1903; interred in White Valley cemetery. Family of Bertha M. Lauffer, daughter of Joseph Lauffer, son of John, son of Henry, son of Christian Lauffer, the pioneer, born March 22, 1876; married February 14, 1895, by Rev. P.
William McC. Alexander, born November 23, 1896. Sarah E. Alexander, born February 7, 1898. Harry C. Alexander, born December 8, 1901. 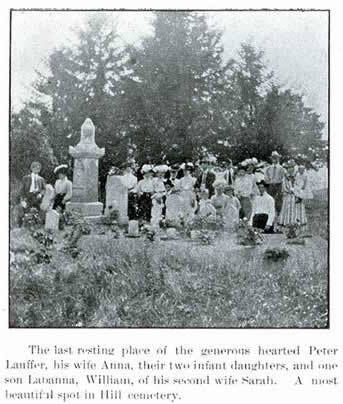 Family of Anna Lauffer, daughter of John, son of Henry, son of Christian Lauffer, the pioneer, born April 2, 1838; married April 20, 1858, by Rev. N. P. Hacke, to N. Rumbaugh. She was married a second time by Rev. Stitt, to Mr.\ Charles Myers, from Greensburg, Pa.; residence, Dunseith, Rolette County., North Dakota (Box 7). Joseph A. Lauffer, Chairman of the Lauffer History Publication Committee, is one of Greater Greensburg’s leading business men. His store is located on West Second Street, near the corner of Mill Street. This store is favorably situated in a residence portion of the city, and enjoys the patronage of a number of Greensburg citizens, who reside in that immediate locality, as well as the good will and trade of many in other parts of Greensburg, and from the country districts. When contemplating leasing this room Mr. Lauffer’s friends did what they could to discourage the venture, pointing out the fact that others had failed to succeed in that location. Despite these well-meant efforts, however, he leased the room, which he successfully occupied for four years. He then leased the store room in the Pollins building, corner of Mill and Second streets. attended the country school, and assisted his father on the farm. He afterwards graduated in a high school and was thus prepared to step out into the world, qualified for any ordinary business pursuit. The excellent woman who supplied a mother’s place taught him to love the things that are good, and carefully guided his young feet along the paths of righteousness. This training, together with the example of an upright father, instilled within him the virtues that have characterized his life, and have enabled him to win and retain many friends. When visiting in the vicinity of Latrobe he met Miss Elizabeth C. Bridenthal, daughter of Mr. Harry A. Bridenthal, the result of which meeting was a wedding, and it seems that Mr. Lauffer’s lucky star was in the ascendancy, as he secured a prize in the matrimonial lottery, and a wife who proved herself a loyal helpmate in every sense of the term. They have one child, a bright little girl, Grace Mildred. to see the ships, and to visit the Old Homestead; near the Stone church where he went to see his Uncle Peter,- was very interesting and will never be forgotten by the writer, who was much entertained by his way of stating thing- they happened about eighty odd years before. Several weeks later the writer and his wife again visited this Renowned gentleman and were much pleased with his anecdotes and his remarkable memory. His daughter, who kept house for him, certainly was a great comfort to her father.